There were a bunch of these inside a large red mushroom on the side of a tree. Quite a difference between larvae. Are you certain these are the lavae that became the B.cornutus pupa? Check out these larvae from Rattlebox. I read the comments under Rattlebox's picture, and the results are very interesting. The other one that you mentioned, there could be a mixup, but I don't remember collecting a larva that looked like yours. More likely a mixup on my end. I know I was incredulous that such a larva could produce a tenebrionid. 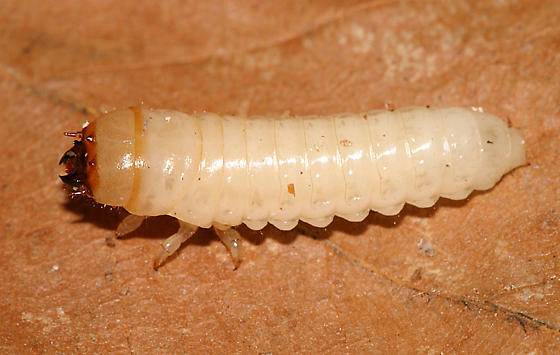 If you saved the mushroom and larvae, it might be possible to get a larva/adult photo series for the bugguide site. and see if I can get the mushroom. That makes sense, wish I would have thought of it at the time.